Let me tell you, if you must turn 30, do it in the Caribbean. Just kidding, I love birthdays! I think it’s important to celebrate each and every milestone in our lives, no matter how small it may seem. But turning 30 is a big one! My actual birthday was November 3rd, and Dan took me to my favorite restaurant, ZoZo’s at the Sugar Mill. 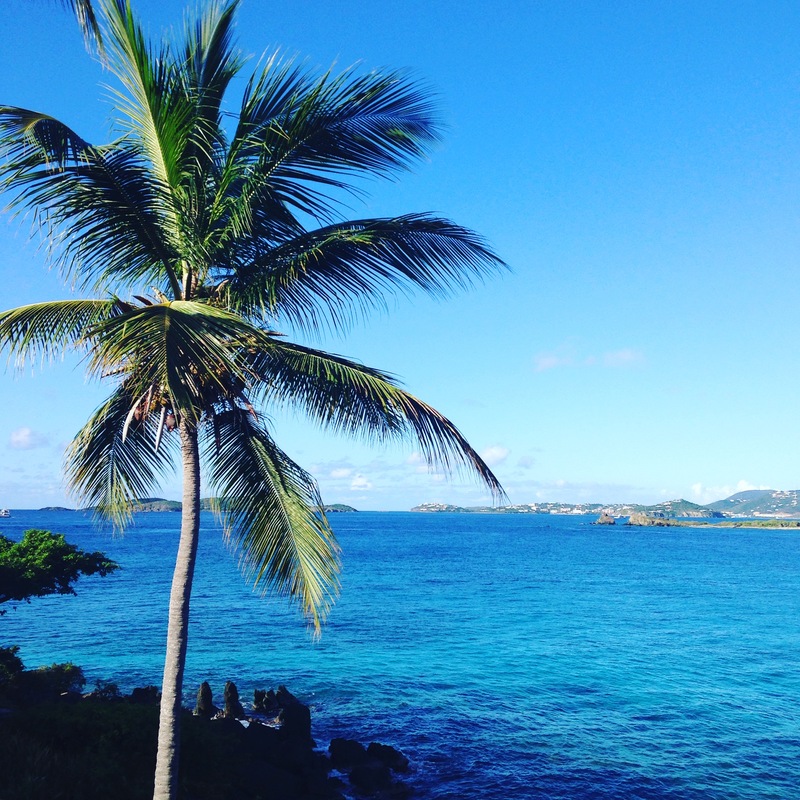 Located at the Caneel Bay Resort on St. John, this place has been our go-to for special moments while we’ve lived here. I always get the same thing, I always leave stuffed, and the view never gets old. That weekend I flew to Tampa for a quick trip. I went to a training session and became a certified Spinning instructor. I’ve been spinning for years but now I get to share it with others. 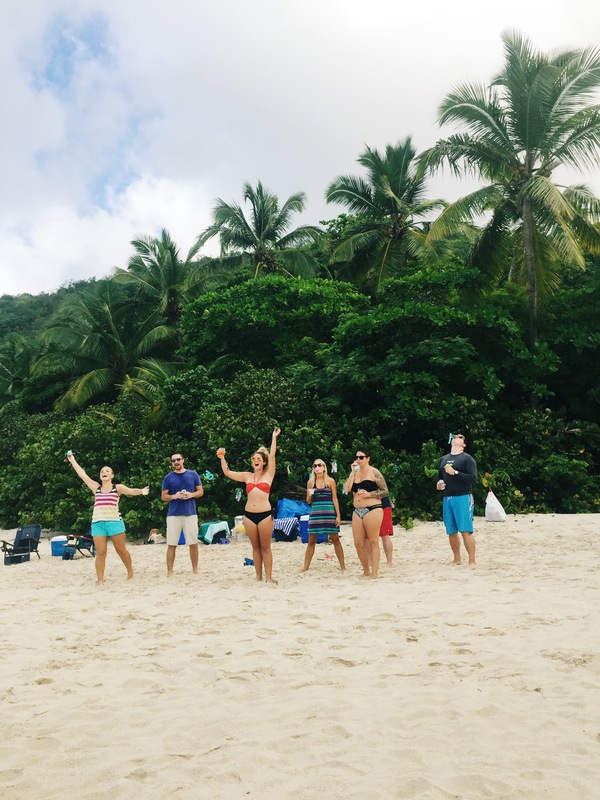 Right now I’m teaching twice a week at Pure Balance in St. Thomas and loving it! The following weekend I had asked our friend Tamara to take some photos for our holiday cards. Her point of view is super cool, check out her blog Southern Grade and you’ll be blown away by her talent! Dan had told me not to make other plans that day because he really wanted to have a beach day. Tamara convinced me to go to St. John to take pictures, so I figured we’d just spend the rest of the day there on the beach. 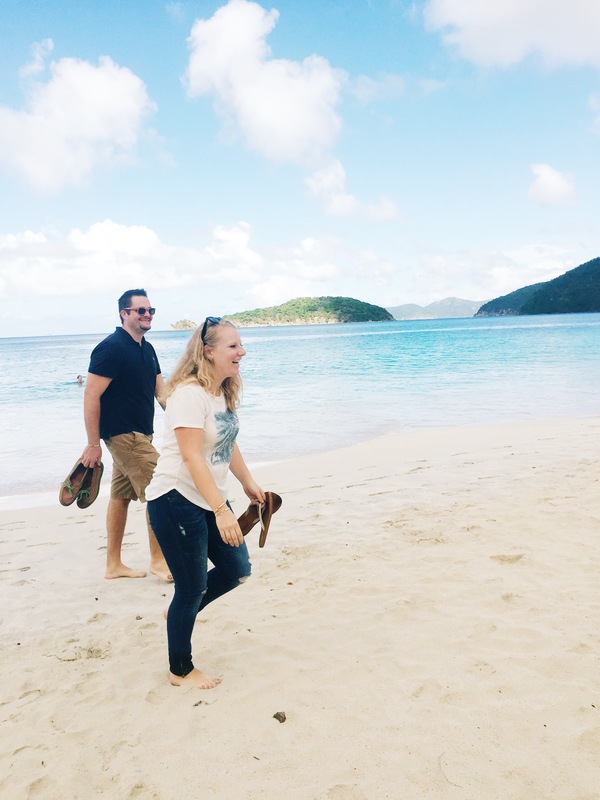 That morning, though, Dan surprised me and said we were going to spend the night on St. John and go to dinner, hooray! I was very excited as I packed a quick overnight bag and we were scurrying out the door to meet Tamara to go to the car ferry. We took photos all throughout the Caneel Bay property and then she said we had one more stop at Cinnamon Bay. 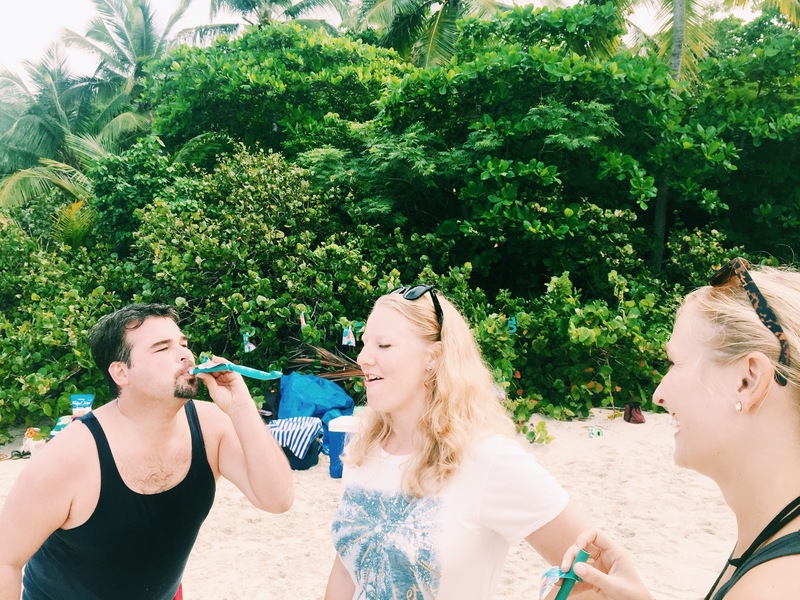 As we were walking down the beach to find our next “photo spot”, an unruly group of people came running out onto the beach with noisemakers and “30” signs. Surprise birthday beach party!? Yes please! A BIG thank you to Dan and my mom, who coordinated with everyone to make this happen. My mom, being the ever-organized woman she is, sent down Little Mermaid plates, napkins, goodie bags and all sorts of fun things for us to celebrate with. I got TWO birthday cakes; one was a mermaid cake and another homemade one from Adrien! With champagne toasts, wading in the water on a perfect day was lots of fun, and I felt like such a lucky lady to have friends that wanted to spend the day with me. Tamara captured the surprise and moments after, and I’m so glad she was there. Thank you, thank you, thank you to everyone who was there and there in spirit. I’m so SO grateful. What a way to wake up. St. John never disappoints. 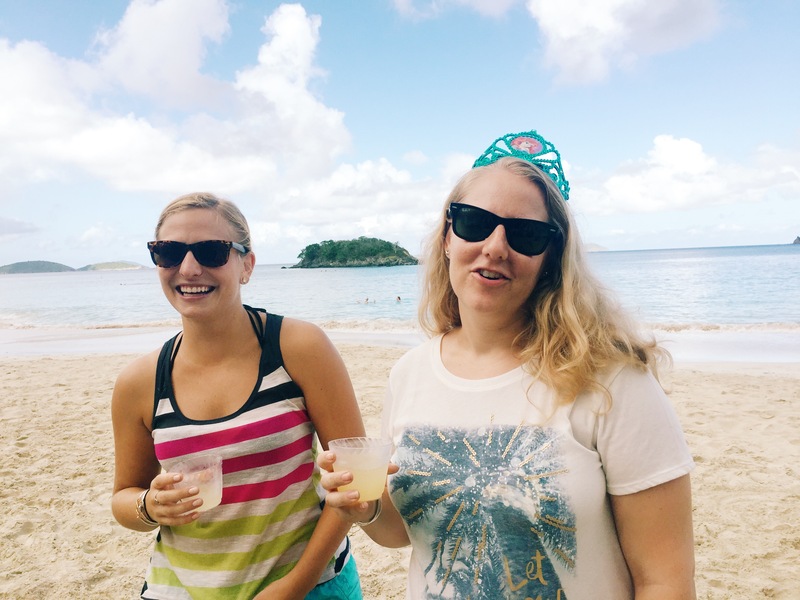 This entry was posted in Friends, Island Hopping, Island Life and tagged beach birthday, birthday party, Caribbean birthday, Cinnamon Bay Beach, Cinnamon Beach, friends, St. John, STJ. Bookmark the permalink. SO glad the surprise got pulled off & you had such a fun time!! This looks like an awesome birthday party.